McCarthyism” is a word thrown around a lot nowadays, and in the process its true meaning – and horror – has been increasingly obscured. McCarthyism is not just the hounding of someone because their views are unpopular. It is the creation by the powerful of a perfect, self-rationalising system of incrimination – denying the victim a voice, even in their own defence. It presents the accused as an enemy so dangerous, their ideas so corrupting, that they must be silenced from the outset. Their only chance of rehabilitation is prostration before their accusers and utter repentance. McCarthyism, in other words, is the modern political parallel of the witch hunt. In an earlier era, the guilt of women accused of witchcraft was tested through the ducking stool. If a woman drowned, she was innocent; if she survived, she was guilty and burnt at the stake. A foolproof system that created an endless supply of the wicked, justifying the status and salaries of the men charged with hunting down ever more of these diabolical women. And that is the Medieval equivalent of where the British Labour party has arrived, with the suspension of MP Chris Williamson for anti-semitism. Williamson, it should be noted, is widely seen as a key ally of Jeremy Corbyn, a democratic socialist who was propelled unexpectedly into the Labour leadership nearly four years ago by its members. His elevation infuriated most of the party’s MPs, who hanker for the return of the New Labour era under Tony Blair, when the party firmly occupied the political centre. Corbyn’s success has also outraged vocal supporters of Israel both in the Labour party – some 80 MPs are stalwart members of Labour Friends of Israel – and in the UK media. Corbyn is the first British party leader in sight of power to prefer the Palestinians’ right to justice over Israel’s continuing oppression of the Palestinians. For these reasons, the Blairite MPs have been trying to oust Corbyn any way they can. First through a failed re-run of the leadership contest and then by assisting the corporate media – which is equally opposed to Corbyn – in smearing him variously as a shambles, a misogynist, a sympathiser with terrorists, a Russian asset, and finally as an “enabler” of anti-semitism. This last accusation has proved the most fruitful after the Israel lobby began to expand the definition of anti-semitism to include not just hatred of Jews but also criticism of Israel. Labour was eventually forced to accept a redefinition, formulated by the International Holocaust Remembrance Alliance, that conflates anti-Zionism – opposition to Israel’s violent creation on the Palestinians’ homeland – with anti-semitism. Once the mud stuck through repetition, a vocal group of Labour MPs began denouncing the party for being “institutionally anti-semitic”, “endemically anti-semitic” and a “cesspit of anti-semitism”. The slurs continued relentlessly, even as statistics proved the accusation to be groundless. The figures show that anti-semitism exists only in the margins of the party, as racism does in all walks of life. Meanwhile, the smears overshadowed the very provable fact that anti-semitism and other forms of racism are rearing their head dangerously on the political right. But the witchfinders were never interested in the political reality. They wanted a never-ending war – a policy of “zero tolerance” – to root out an evil in their midst, a supposed “hard left” given succour by Corbyn and his acolytes. This is the context for understanding Williamson’s “crime”. Despite the best efforts of our modern witchfinder generals to prove otherwise, Williamson has not been shown to have expressed hatred towards Jews, or even to have made a comment that could be interpreted as anti-semitic. One of the most experienced of the witchfinders, Guardian columnist Jonathan Freedland, indulged familiar McCarthyite tactics this week in trying to prove Williamson’s anti-semitism by association. The MP was what Freedland termed a “Jew baiter” because he has associated with people whom the witchfinders decree to be anti-semites. Shortly before he found himself formally shunned by media commentators and his own parliamentary party, Williamson twice confirmed his guilt to the inquisitors. First, he dared to challenge the authority of the witchfinders. He suggested that some of those being hounded out of Labour may not in fact be witches. Or more specifically, in the context of constant claims of a Labour “anti-semitism crisis”, he argued that the party had been “too apologetic” in dealing with the bad-faith efforts of those seeking to damage a Corbyn-led party. In other words, Williamson suggested that Labour ought to be more proactively promoting the abundant evidence that it was indeed dealing with what he called the “scourge of anti-semitism”, and thereby demonstrate to the British public that Labour wasn’t “institutionally anti-semitic”. Labour members, he was pointing out, ought not to have to keep quiet as they were being endlessly slandered as anti-semites. The flood of exaggerated claims of antisemitism make it harder to deal with any real instances of antisemitism. The credibility of well-founded allegations is undermined by the less credible ones and real perpetrators are more likely not to be held to account. Crying wolf is dangerous when there are real wolves around the corner. This was the reality that Chris Williamson was drawing attention to. As with all inquisitions, however, the witchfinders were not interested in what Williamson actually said, but in the threat he posed to the narrative they have created to destroy their enemy, Corbynism, and reassert their own power. So his words were ripped from their context and presented as proof that he did indeed support witches. He was denounced for saying what he had not: that Labour should not apologise for its anti-semitism. 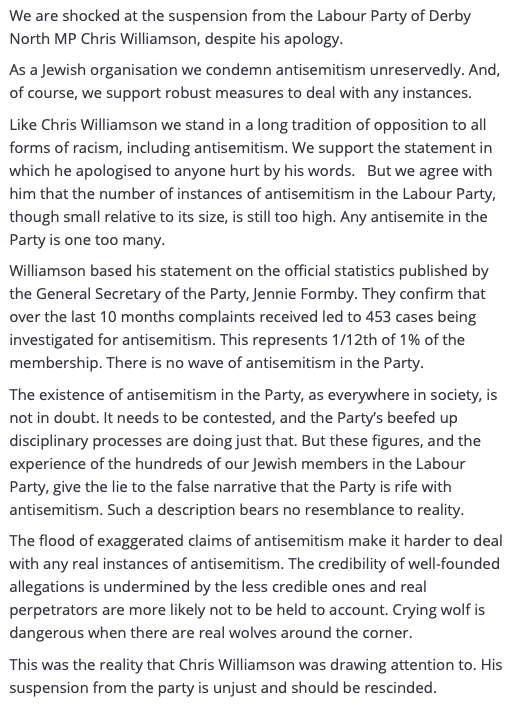 In this dishonest reformulation of Williamson’s statement, the witchfinders claimed to show that he had supported anti-semitism, that he consorted with witches. Second, Williamson compounded his crime by publicly helping just such a readymade witch: a black Jewish woman named Jackie Walker. He had booked a room in the British parliament building – the seat of our supposed democracy – so that audiences could see a new documentary on an earlier Labour witch hunt. More than two years ago the party suspended Walker over anti-semitism claims. The screening was to inform Labour party members of the facts of her case in the run-up to a hearing in which, given the current atmosphere, it is likely she will be expelled. The screening was sponsored by Jewish Voice for Labour, which has also warned repeatedly that anti-semitism is being used malevolently to silence criticism of Israel and weaken Corbyn. Walker was seen as a pivotal figure by those opposed to Corbyn. She was a co-founder of Momentum, the grassroots organisation established to support Corbyn after his election to the leadership and deal with the inevitable fallout from the Blairite wing of MPs. Momentum expected a rough ride from this dominant faction, and they were not disappointed. The Blairites still held on to the party machinery and they had an ally in Tom Watson, who became Corbyn’s deputy. Walker was one of the early victims of the confected claims of an Labour “anti-semitism crisis”. But she was not ready to roll over and accept her status as witch. She fought back. First, she produced a one-woman show about her treatment at the hands of the Labour party bureaucracy – framed in the context of decades of racist treatment of black people in the west – called The Lynching. And then her story was turned into a documentary film, fittingly called Witch Hunt. It sets out very clearly the machinations of the Blairite wing of MPs, and Labour’s closely allied Israel lobby, in defaming Walker as part of their efforts to regain power over the party. For people so ostensibly concerned about racism towards Jews, these witchfinders show little self-awareness about how obvious their own racism is in relation to some of the “witches” they have hunted down. But that racism can only be understood if people have the chance to hear from Walker and other victims of the anti-semitism smears. Which is precisely why Williamson, who was trying to organise the screening of Witch Hunt, had to be dealt with too. Walker is not the only prominent black anti-racism activist targeted. Marc Wadsworth, another longtime ally of Corbyn’s, and founder of the Anti-Racist Alliance, was “outed” last year in another confected anti-semitism scandal. The allegations of anti-semitism were impossible to stand up publicly, so finally he was booted out on a catch-all claim that he had brought the party “into disrepute”. Jews who criticise Israel and support Corbyn’s solidarity with Palestinians have been picked off by the witchfinders too, cheered on by media commentators who claim this is being done in the service of a “zero tolerance” policy towards racism. As well as Walker, the targets have included Tony Greenstein, Moshe Machover, Martin Odoni, Glyn Secker and Cyril Chilson. But there are a set of very obvious problems with that position, and they have gone entirely unexamined by those promoting the “institutional anti-semitism” and “zero tolerance” narratives. First, it is impossible to be a home to all Jews in Labour, when the party’s Jewish members are themselves deeply split over key issues like whether Corbyn is a force for good and whether meaningful criticism of Israel should be allowed. A fanatically pro-Israel organisation like the Jewish Labour Movement will never tolerate a Corbyn-led Labour party reaching power and supporting the Palestinian cause. To pretend otherwise is simple naivety or deception. That fact was demonstrably proven two years ago in the Al Jazeera undercover documentary The Lobby into covert efforts by Israel and its UK lobbyists to undermine Corbyn from within his own party through groups like the JLM and MPs in Labour Friends of Israel. It was telling that the party machine, along with the corporate media, did its best to keep the documentary out of public view. The MPs loudest about “institutional anti-semitism” in Labour were among those abandoning the party to join the Independent Group this month, preferring to ally with renegade Conservative MPs in an apparent attempt to frustrate a Corbyn-led party winning power. Further, if a proportion of Jewish Labour party members have such a heavy personal investment in Israel that they refuse to countenance any meaningful curbs on Israel’s abuses of Palestinians – and that has been underscored repeatedly by public comments from the JLM and Labour Friends of Israel – then keeping them inside the party will require cracking down on all but the flimsiest criticism of Israel. It will tie the party’s hands on supporting Palestinian rights. In the name of protecting the “Israel right or wrong” crowd from what they consider to be anti-semitic abuse, Labour will have to provide institutional support for Israel’s racism towards Palestinians. In doing so, it will in fact simply be returning to the status quo in the party before Corbyn, when Labour turned a blind eye over many decades to the Palestinians’ dispossession by European Zionists who created an ugly anachronistic state where rights accrue based on one’s ethnicity and religion rather than citizenship. Those in Labour who reject Britain’s continuing complicity in such crimes – ones the UK set in motion with the Balfour Declaration – will find, as a result, that it is they who have no home in Labour. That includes significant numbers of anti-Zionist Jews, Palestinians, Muslims and Palestinian solidarity activists. If the creation of a “safe space” for Jews in the Labour party is code, as it appears to be, for a safe space for hardline Zionist Jews, it will inevitably require that the party become a hostile environment for those engaged in other anti-racism battles. Stripped bare, what Lansman and the witchfinders are saying is that Zionist Jewish sensitivities in the party are the only ones that count, that anything and everything must be done to indulge them, even if it means abusing non-Zionist Jewish members, black members, Palestinian and Muslim members, and those expressing solidarity with Palestinians. This is precisely the political black hole into which simplistic, kneejerk identity politics inevitably gets sucked. Right now, the establishment – represented by Richard Dearlove, a former head of the MI6 – is maliciously trying to frame Corbyn’s main adviser, Seumas Milne (image on the right with Jeremy Corbyn), as a Kremlin asset. While the witchfinders claim to have unearthed a “pattern of behaviour” in Williamson’s efforts to expose their smears, in fact the real pattern of behaviour is there for all to see: a concerted McCarthyite campaign to destroy Corbyn before he can reach No 10. Corbyn’s allies are being picked off one by one, from grassroots activists like Walker and Wadsworth to higher-placed supporters like Williamson and Milne. Soon Corbyn will stand alone, exposed before the inquisition that has been prepared for him. Then Labour can be restored to the Blairites, the members silenced until they leave and any hope of offering a political alternative to the establishment safely shelved. Ordinary people will again be made passive spectators as the rich carry on playing with their lives and their futures as though Britain was simply a rigged game of Monopoly. If parliamentary politics returns to business as usual for the wealthy, taking to the streets looks increasingly like the only option. Maybe it’s time to dust off a Yellow Vest.